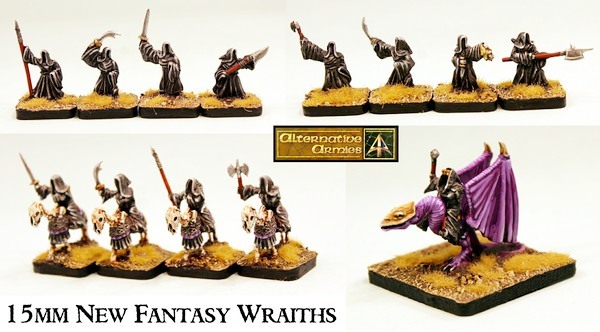 Alternative Armies: HOT 15mm Fantasy range expands with new packs of Wraiths! 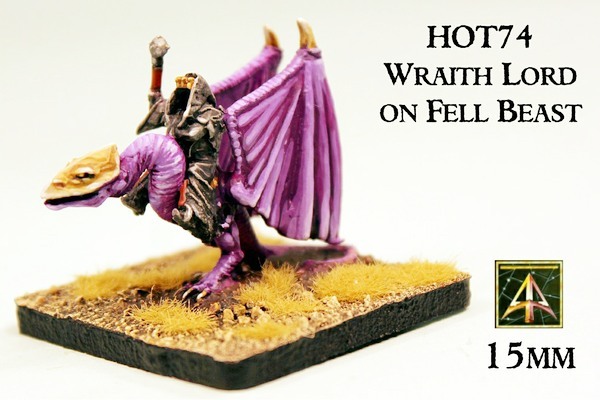 HOT 15mm Fantasy range expands with new packs of Wraiths! Have you got an Undead 15mm Army? 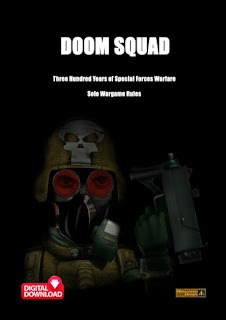 Need some gliding death dealers for it? 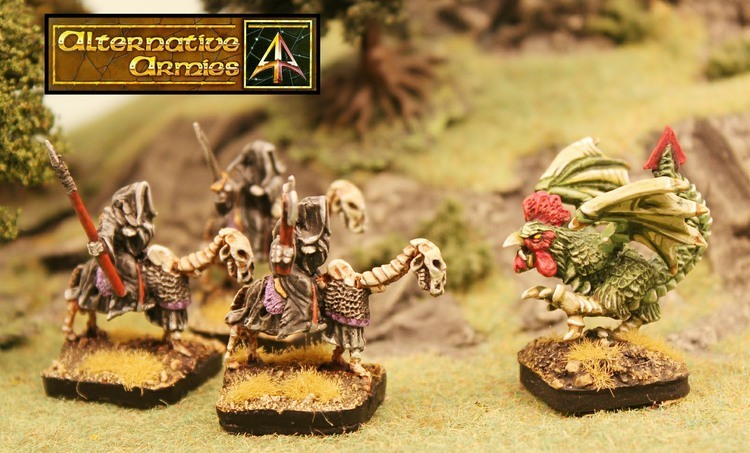 Here at Alternative Armies we have you covered with our new packs and re-mastered pack too which give you more than a dozen Wraiths to put into the fray against the living. 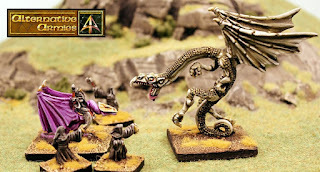 Go to the mighty HOT 15mm Fantasy Range now with one hundred and twenty codes HERE or read on for more. 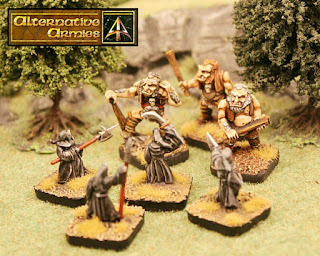 We have gone a little Wraith mad at Alternative Armies this November with not only these new 15mm Wraiths but also new 28mm Wraiths and a whole new unit with characters of Wraiths for Flintloque too. 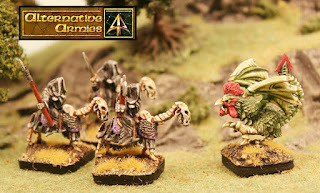 Sculpted by Sam Croes these diminutive robed servants of the Necromancer have really grown on me! This pack contains sixteen 15mm scale white metal miniatures in a random but even mix of four poses. The poses are as follows: Wraith with Spear, Wraith with curved Sword overhead, Wraith with Sword Raised, Wraith with Poleaxe. As with all HOT miniatures you can select a pack or a sampler of one of each pose from this code for skirmish gaming. Great for any game system these miniatures are supplied unassembled and unpainted. Go HERE. 5.00GBP per pack. This pack contains sixteen 15mm scale white metal miniatures in a random but even mix of four poses. The poses are as follows: Wraith with Axe, Wraith brandishing curved Sword, Wraith with severed Head raised, Wraith with Halberd. As with all HOT miniatures you can select a pack or a sampler of one of each pose from this code for skirmish gaming. Great for any game system these miniatures are supplied unassembled and unpainted. Go HERE. 5.00GBP per pack. 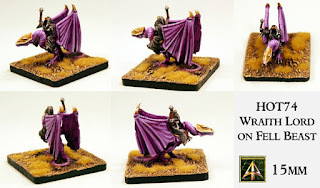 This pack contains six 15mm scale white metal miniatures (rider and mount) in a random but even mix of four poses. The poses are as follows: Wraith with Sword on Undead Horse, Wraith with curved Sword on Undead Horse, Wraith with Spear on Undead Horse, Wraith with double headed Axe on Undead Horse. As with all HOT miniatures you can select a pack or a sampler of one of each pose from this code for skirmish gaming. Great for any game system these miniatures are supplied unassembled and unpainted. Go HERE. 5.00GBP per pack. We have re-mastered the popular Wraith Lord on Fell Beast to go alongside these new packs and it is looking glorious. 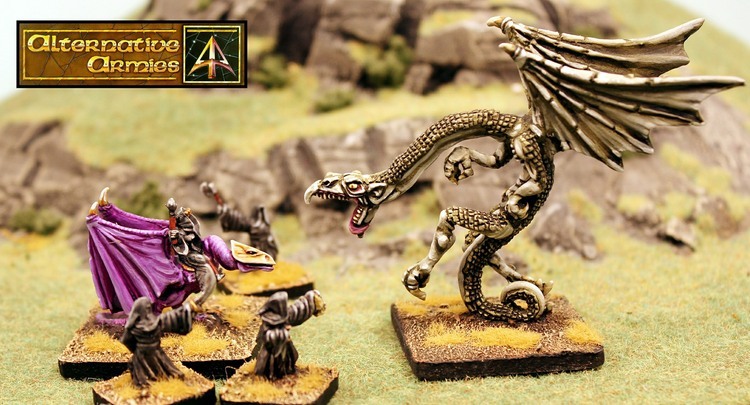 This pack contains one 15mm scale white metal kit consisting of the Fell Beast Body, Left Wing, Right Wing and Wraith Lord rider with Crown and Mace. 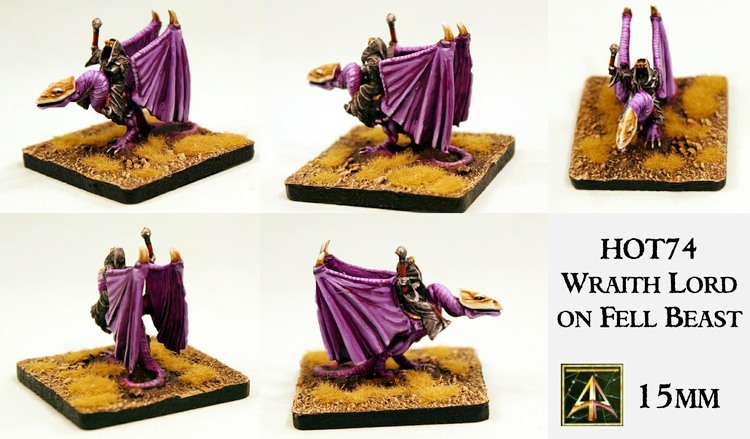 A flying scout or general for your Necromancer of Evil armies. A Lord of Shadow. The Fell Beast is approx 40mm from head to tail. Great for any game system and goes excellently with our other HOT codes for Wraiths and Undead. Supplied unassembled and unpainted. Go HERE. 5.00GBP per pack. The living are in peril with the coming of these Wraiths! If you like them then you might want to check out our other 15mm fantasy ranges. A huge choice of new and classic as well as all manner of characters, beasts and monsters plus of course the excellent Sengoku Japanese Fantasy Range. We also have HOTT 24AP Armies and 15mm Buildings. Click on the links to visit these ranges to see what we have.